The Nevada State Democratic Party filed a complaint today with the Nevada Commission on Ethics requesting an investigation into reports that Attorney General Adam Laxalt used the powers of his office to try to help his largest campaign donor and failed to avoid his own conflicts of interest on the matter. 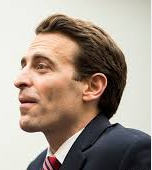 Laxalt recently sought to pressure the chairman of the Gaming Control Board to intercede in a lawsuit on behalf of Nevada’s wealthiest casino magnate, prompting the regulator to secretly record his conversation with Laxalt and turn over the tape to the FBI. The Gaming Control Board recently confirmed the existence of that recording last week, and the Nevada State Democratic Party’s complaint includes a Freedom of Information Act (FOIA) request for its release in conjunction with the ethics complaint. 2016 has finally rolled in, which means we’re now seven weeks away from holding caucuses across the state, the first in the west caucuses to select the Democratic candidate for President. Thus, it’s time to identify folks who will serve as Precinct Chairs, Check-in Desk workers, and Same-Day Registration workers. A caucus is a gathering of neighbors who meet to discuss grassroots politics. Democrats will join with others in their precinct to pledge their support for their favorite presidential candidate and thereby award delegates to the candidates. Who Can Attend a Precinct Caucus? Precinct caucuses are open meetings. Anyone can attend and observe, but only registered Democrats (including 17 year olds who will be 18 by November 8, 2016 and register as Democrats) can participate. Young people who will NOT be 18 by November 8, 2016 are encouraged to attend as Youth Attenders. They can not participate in the caucus. They are there strictly to observe. All participants must be Democrats registered to vote in their precinct. A list of registered Democrats will be available at the caucuses. If you are not on the list and are not registered to vote, you will be able to register as a Democrat at the caucus. Seventeen-year-olds, who will be 18 by the general election on November 8, 2016, will be allowed to fully participate. They will be required to fill out a voter registration card and register as a Democrat if they have not done so already. Participants may register to vote at the caucus. Republicans, nonpartisans and others can change registration to become a Democrat that day. Is there a way to vote early or cast an absentee vote? 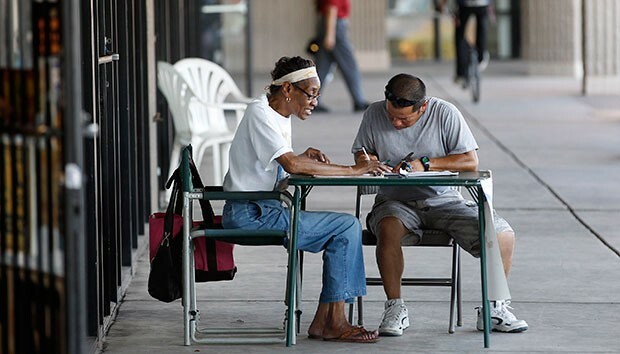 A volunteer for President Barack Obama’s re-election campaign, left, registers someone to vote as volunteers register new voters at a table set up in front of campaign headquarters at a local shopping plaza in Phoenix, June 2012. The United States is undergoing a historic demographic shift, with people of color expected to make up a majority of the population by 2044. Despite the seemingly long trajectory of these changes, the political implications are already being felt. The most significant of these shifts is the sharp increase in the number of Latino voters and their share of the electorate. In the 2012 presidential election, Latino voters—71 percent of whom supported President Barack Obama—helped create a firewall for President Obama in key states. In Colorado, for example, the rising share of Latino voters was enough to win the state for Democrats despite white voters’ support for President Obama dropping by 6 percentage points from 2008. The rising share of Latino voters in key states may have an even more significant impact on the 2016 presidential election, especially if voter turnout rates are high. To gain a better understanding of the growing Latino influence, the Center for American Progress Action Fund conducted an electoral simulation of the six states with the largest projected share of Latino eligible voters in 2016 and for which 2012 exit polling data are available. Read more and explore our findings. In Nevada, Latino voters could make up more than a fifth of all voters, spelling trouble for Republicans. If Democrats are able to hold onto 2012 levels of support from voters of color and turnout rates remain the same in 2016 (Simulation 1), the Democratic margin of victory in Nevada could increase nearly 3 percentage points. Even if Republicans are able to regain their higher support levels from voters of color from 2004 as well as their high support levels from white voters from 2012 (Simulation 3), Democrats would still have a three-point margin of victory. NOT Good Enough for the Fearful? In the days since the terrorist attack in Paris, there has been a huge debate in the United States over Syrian refugees. While the U.S. has committed to taking 10,000 people fleeing the Syrian civil war, some have argued that there is no way to ensure that terrorists won’t enter the country posing as refugees. 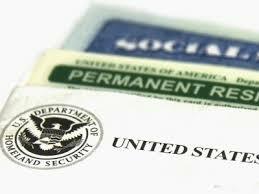 The Obama administration has responded by saying that the vetting process is extremely rigorous. So, putting aside emotional rhetoric about this issue, what exactly is that process? According to Secretary Jeh Johnson, more than 23,000 potential refugees have been referred to the U.S. and that only 2,000 have made it past the screening. But according to the GOP fearmongers, our process isn’t good enough for them. Is that because 2,000 worthy souls actually made it through the process?